This week the school's go back in Glasgow... the summer (if you can call it that!!) has flown by. It's time to get organised with uniforms, school shoes, rucksacks for the new term. 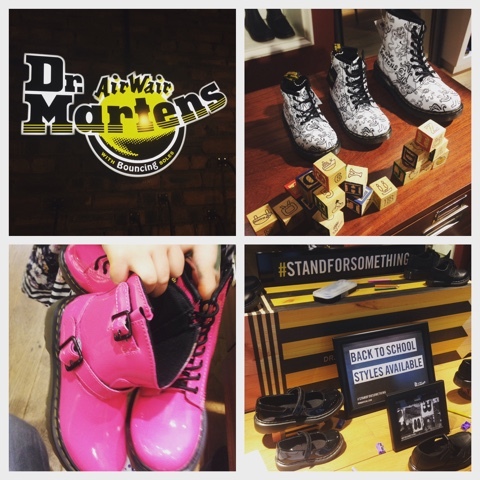 We were invited along to Dr Martens to check out their Back to School range for kids. Being completely honest, I had never stepped into a Dr Martens store before (I didn't even realise there was one on Sauchiehall Street, right opposite The Body Shop) and I've never owned (or even tried on for that matter) a pair of Dr Martens myself. The history of the brand really interested me. Dr Martens air-cushioned sole was designed by German inventor Dr Klaus Maertens and was created to meet the specific need or providing additional support and comfort for his broken foot. The Dr Martens boot with its trademark yellow stitch, grooved sole and heel-loop was manufactured by R Griggs and Co, British boot makers, as a boot for workers and was originally worn by postmen and policemen due to its comfortable, durable and lightweight design. A specific range of "Made in England" products are still manufactured at the Cobbs Lane factory. This is the home of Dr Martens where the first pair rolled off the production line on April 1st, 1960. In terms of the children's Back to School range, there isn't a huge choice but that perhaps makes our job as parents easier as my little ones couldn't fuss over which ones to pick! I personally love the patent Mary Jane style for girls. We tried a Chelsea boot style for my son (which doesn't appear to be on the website so I can't show you a photo), but it was unfortunately a bit tight around his foot so instead we chose the Velcro shoe, Jerry, which was much more comfortable for him. That's probably the only downside of these shoes - they are not available in different width fittings. However, huge plus point for me is the sturdy sole. These shoes are going to last well, plus when the weather turns and the pavements are icy the grip on the sole will be invaluable. Velcro closure rather than laces is also ideal for my son's age as I haven't attempted to teach him how to tie a bow yet! We left the shop with him wearing his new shoes and despite walking around for hours in Glasgow's city centre there wasn't a single complaint of the shoes hurting - which I had anticipated given they were a brand new pair. Unlike the adult shoes, the children's ones are made with softer leather. Which brings me onto the adult shoes... I felt that it was the ideal time for me to try on a few pairs. Crikey, the original shoes were sore and certainly would have needed lots of breaking in!! I then tried on a pair of Teresa boots, these have the air-cushioned sole, but it's slimmer in comparison to the original boots. The fit overall is a bit slimmer so the boots don't look as bulky as the original ones. I love the colour (cherry red high-shine rub-off Arcadia) and the strapping wraps around the back with the buckle gives a bit of extra interest. I fell in love and ended up buying them for myself... and I have been wearing them every day since!! 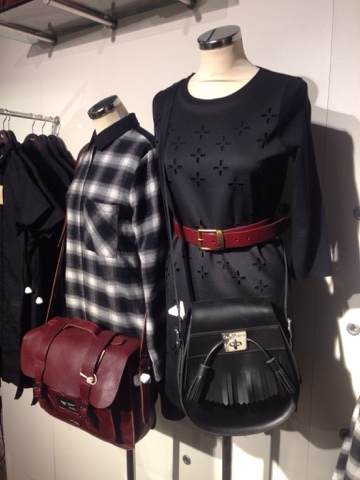 I can dress them up with tights and a tunic for work, or dress them down with jeans and a jumper. They're super versatile and unlike the original shoes I tried, these didn't need breaking in (I have been wearing them with two pairs of socks as I've got cold feet all the time!). 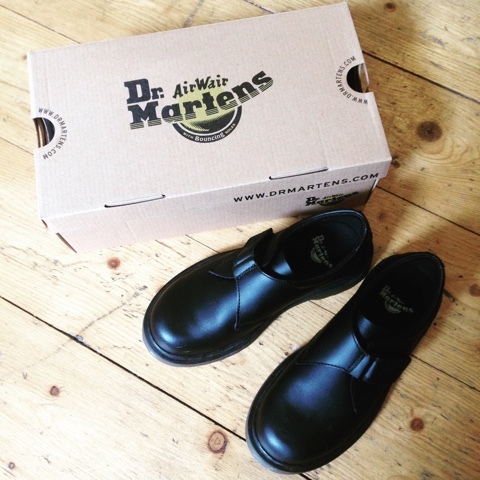 We received one complimentary pair of school shoes - thank you Dr Martens. Opinions, as always, are honest and my own.